Sunderland and Arsenal play out a goalless draw at the Stadium of Light after both sides miss chances to nab a winner. Eight Tottenham Hotspur and Leicester City players are named in the PFA Premier League Team of the Year, but there is no place for Arsenal's Mesut Ozil. Andy Carroll scores a 10-minute hat-trick as West Ham United and Arsenal play out an enthralling 3-3 draw in Saturday's Premier League clash at the Boleyn Ground. Arsenal full-back Hector Bellerin insists that his side will fight for the Premier League title until the end of the season following their 4-0 drubbing of Watford. Arsenal close the gap on Leicester City and Tottenham Hotspur in the Premier League title race with a comfortable 4-0 victory over Watford at the Emirates Stadium. Arsene Wenger names an unchanged XI as Arsenal welcome Watford to the Emirates. Relive Arsenal's 4-0 drubbing of Watford as the Gunners put the pressure on Leicester and Tottenham in the Premier League title race. A report claims that Manchester City and Bayern Munich have joined the race for Arsenal's Spanish right-back Hector Bellerin. Paris Saint-Germain step up Hector Bellerin pursuit? 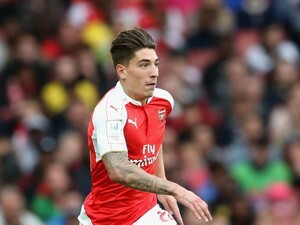 A report in France claims that Paris Saint-Germain are preparing a summer move for Arsenal's young right-back Hector Bellerin. Barcelona reportedly line up Arsenal full-back Hector Bellerin as a replacement for Dani Alves should the Brazilian be lured by a big-money move to China this summer. Arsenal reduce the gap to second-placed Tottenham Hotspur to three points after a comfortable 2-0 win away at Everton. Barcelona book their spot in the quarter-finals of the Champions League courtesy of a 3-1 win over Arsenal in their last-16 second leg in Spain. Arsenal make six changes for their FA Cup fifth-round replay against Hull City at the KC Stadium, while the hosts make seven. Tottenham Hotspur miss the chance to go top of the Premier League as North London rivals Arsenal fight back for a 2-2 draw at White Hart Lane. Arsenal miss the chance to close within three points of Premier League leaders Leicester City by losing 2-1 at home to Swansea City. Lionel Messi scores twice as European champions Barcelona record a 2-0 win at Arsenal in the first leg of their last-16 clash in the Champions League. Six-time Olympic champion Usain Bolt laughs off claims that Arsenal full-back Hector Bellerin is faster than him in a sprint over 40 metres. Sports Mole looks ahead to Tuesday's Champions League last-16 first-leg clash between Arsenal and European champions Barcelona at the Emirates Stadium. Arsenal manager Arsene Wenger admits that he blocked Mathieu Debuchy's loan move to Manchester United. Mathieu Debuchy reveals that Arsenal boss Arsene Wenger blocked his proposed loan move to Manchester United. Danny Welbeck marks his first appearance of the season with a 95th-minute winner to hand Arsenal a 2-1 victory over 10-man title rivals Leicester City. Arsenal climb up to third in the Premier League table with their first win in five games, beating Bournemouth 2-0 at the Vitality Stadium. Arsenal full-back Mathieu Debuchy joins Bordeaux on loan until the end of the season. Sports Mole looks ahead to Tuesday night's Premier League match at the Emirates as Arsenal take on Southampton. A report claims that Arsenal defender Mathieu Debuchy is only prepared to leave the Emirates on loan this month, rather than on a permanent deal. Arsenal right-back Hector Bellerin says that he and his teammates need to keep their heads up following Sunday's defeat to Chelsea. Mathieu Debuchy: "I cannot stay at Arsenal"
Mathieu Debuchy insists that he must leave Arsenal this month amid interest from Aston Villa and Bayer Leverkusen. Bayer Leverkusen, Roma join Mathieu Debuchy race? Arsenal right-back Mathieu Debuchy is reportedly being tracked by Bayer Leverkusen and Roma. Arsene Wenger describes Hector Bellerin as one of the best right-backs in the country after Arsenal's 3-1 win over Sunderland in the FA Cup third round. Aston Villa boss Remi Garde confirms that he has spoken to Arsenal about signing Mathieu Debuchy this month. Arsenal are reportedly ready to listen to any offers for Mathieu Debuchy, but would prefer to send the right-back out on loan. Arsenal move two points clear at the top of the Premier League table with a 1-0 victory over Newcastle United. Arsene Wenger admits that French right-back Mathieu Debuchy might be allowed to leave the club in January so that he can increase his chances of playing at Euro 2016. Arsenal are reportedly considering a £4.4m bid for young Barcelona midfielder Sergi Samper in January. Young Arsenal defender John Stones will reportedly join his former side Southampton on a loan deal in January. Theo Walcott challenges Arsenal teammate Hector Bellerin to a sprint race to finally determine which of them is the quicker. Arsenal stars are joined by Premier League rivals during a Christmas party in London. Arsenal defender Mathieu Debuchy reveals that he will hold talks with manager Arsene Wenger soon regarding his future with the Gunners. Sports Mole reviews the action from North London as Arsenal secure a deserved, yet flattering 3-1 win over Sunderland. Jose Mourinho signs Man United contract? Liverpool to reignite Depay interest?